Forty hours after boarding a puddle jumper in Milwaukee, we land in Penang where the hot ocean breeze hits our faces on the tarmac and the sun snatches our attention. We check into the Cathay Hotel, a rambling white building of colonial years, with intricate blue trim throughout and a two-story atrium open to the birds. High ceilings, spacious rooms, the feel of an era gone by. It’s character, for less than $20 a night. We wander the streets at sunset, past nasi stalls, all manner of curry, past a Hindu temple where prayer bells call, past mosques and churches, past Indian streets blaring dance music and lights for “happy Deepaveli.” More than at Christmastime back home, vibrant strings of bulbs in red, green, white and yellow crisscross the alleys. I eat a veg thali plate with mild dhal curry, papadam, fried okra, savory onions and cabbage, mixed pickles and cardamom pudding. 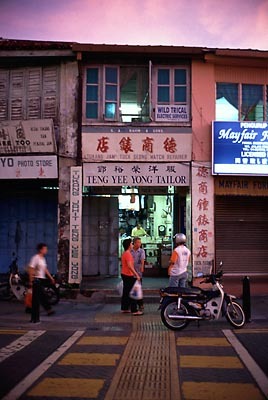 We wander more — through streets of Chinese, Tamil, Malay; life beneath the drone of a muezzin. We stop momentarily at a small Chinese sidewalk stall with monstrous samovars of sweet and bitter tea. Two locals invite us to partake. The bitter, the man says, is for detox. It will make you sweat and pee for good health. After so many hours on planes, we each order one big glass. It tastes of a Chinese herb store; I drink the smell I encounter every time I pass these shops on the street. So bitter, the bite lasts an hour. 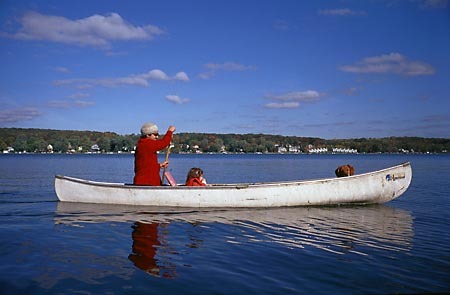 From the sidewalks of age-old tile to the shopfronts of red lettering to the open markets of brazenly colored saris to the pedicabs with flapping Malaysian flags — we are not in Pewaukee anymore, nowhere near a frosty lake. We are 40 hours away by plane (and just an instant by email). 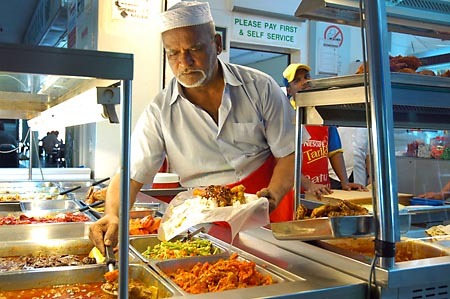 Yet even technology cannot diminish all the cultural space between such worlds — the American Midwest, Malaysian Penang. I still feel the jolt of touchdown in a faraway land. I found your website through Real Thai. 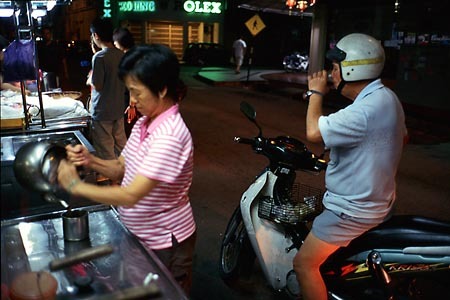 Great article, I am very glad that you stopped over in Penang, albeit for a short while. I am from Penang; currently I reside in SoCal. I hope you get to travel more in Malaysia one day…it’s a fascinating country with fanstastic food! Thanks for visiting! I certainly do hope to return to Penang and explore a bit. My husband and I have spent quite a lot of time in Malaysia this year (in KL, and in search of Nonya food), and we’re always enthused. It’s one of our favorite places to travel. Over the summer we had the great fortune to spend a month in Sarawak…. and that was not nearly enough! That\’s great that you guys spent much time in Malaysia this year. I try to go home every 6 month and constantly draving for the food! Nyonya food is absolutely awesome! I just registered http://www.nyonyafood.com and I hope to start writing as soon as I have time. I actually stumbled on your website looking for a Malaysian restaurant that was in Pewaukee… I’m a Malaysian student who’s studying at Marquette right now, and I know exactly what you mean when you are comparing the American Midwest to Penang. I’m glad you find Penang an attractive place to visit (plus, you have good timing – it sounds like you were smack in the middle of Deepavali and Ramadhan, so there is extra to see in between the two festive periods).